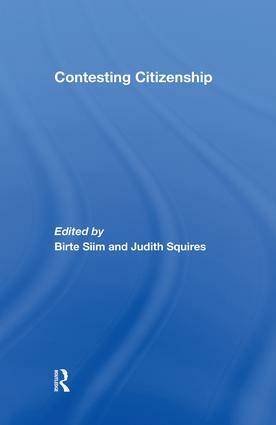 This new book shows how citizenship, and its meaning and form, has become a vital site of contestation. It clearly demonstrates how whilst minority groups struggle to redefine the rights of citizenship in more pluralized forms, the responsibilities of citizenship are being reaffirmed by democratic governments concerned to maintain the common political culture underpinning the nation. In this context, one of the central questions confronting contemporary state and their citizens is how recognition of socio-cultural ‘differences’ can be integrated into a universal conception of citizenship that aims to secure equality for all. Equality policies have become a central aspect of contemporary European public policy. The ‘equality/difference’ debate has been a central concern of recent feminist theory. The need to recognize diversity amongst women, and to work with the concept of ‘intersectionality’ has become widespread amongst political theory. Meanwhile European states have each been negotiating the demands of ethnicity, disability, sexuality, religion, age and gender in ways shaped by their own institutional and cultural histories. This book was previously published as a special issue of Critical Review of International Social & Political Philosophy (CRISPP).